In the chaos of World War II, Polish teenagers Helena and Luzyna Grabowski have lost everything. Without parents or a home, they are shipped to a refugee camp in Persia, where the days ahead hold only darkness. When they hear that orphans are being selected for relocation to New Zealand, Helena is filled with hope—until the officials say they have a place only for her younger sister. On the morning she is to be transported, Luzyna fails to join the chosen group, and Helena takes her place. But the horrors of war—and her guilt at abandoning her sister—follow Helena on the journey across the sea, as a man from her past preys on her fear and remorse. 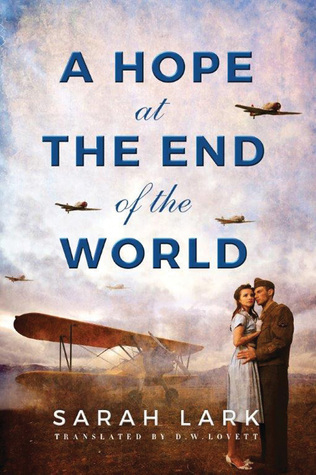 Though the people in New Zealand embrace her, the traumas Helena has suffered threaten her peace and blind her to the devotion of James, a charming, heroic young Allied pilot. If Helena can let go and dare to hope again, she may finally step out of the long shadow of her past to find a future made whole—a new community, a new family, a new love. What drew me to this book was the settings. Most books pertaining to World War II involves a European setting and it's a very rare thing to reach Iran or New Zealand. It's a world war so it only stands to reason that the effects reach the farthermost corner of the globe. Beginning at an orphanage in Iran we meet two sisters separated from their parents. Even though I struggled to connect with these girls it wasn't hard to see the raw deal life threw at them. From Poland to Siberia and now in Iran their lives have been one terrible thing after another. The Iran setting is just a small part of this story as it the journey to New Zealand, but it is an important one that propels this book. One of the things I love about historical fiction is learning new things, with A Hope at the End of the World I was not aware that the actual events took place. The author notes do a great job of explaining the things and I found that very interesting and a great way to end the book. There were times I found the story predictable and to me it had more of a young adult feel. The conflict with the Maori people was interesting. The story had a good premise and will appeal to those that like lighter historical fiction and young adult books. Thanks to AmazonCrossing for an advanced copy (via Netgalley).